Successfully Added Talking Digital Compass to your Shopping Cart. Portable Digital Compass - Get accurate compass bearings with instant real-time updates in digital viewing. Also includes phonetics for verbal reporting of time and direction. When planning for your next camping trip, be sure to remember this handy Portable Digital Compass. Light and compact, this device fits easily into your pocket as the perfect handheld device for indoor and outdoor directional orientation. All you have to do is move the Digital Compass and its LCD will immediately adjust to reflect new coordinates - quick and easy! 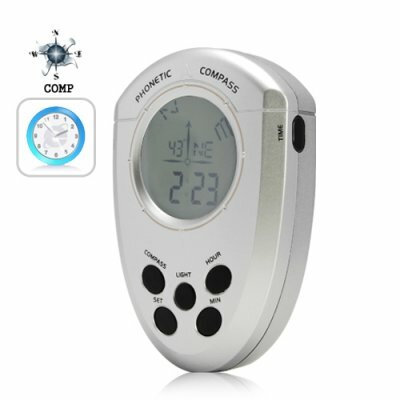 Better yet, this Portable Digital Compass includes a unique phonetic function which will verbally tell you the current time or direction. Also included is a blue LED back light for use at night and a built-in clock and alarm. With its unique phonetic function, this Talking Digital Compass is sure to be a big hit. Available in our warehouse now, order today and we'll express ship it out tomorrow! Brought to you by the leader in China Electronics - Chinavasion. This product is ideal for: Mountain climbing, Trekking, Wildlife safari, Camping, Canoeing, Ballooning, Bird watching, etc. Is there a way to change the voice or add more languages? No, but for those planning on making bulk orders (200+ pieces), contact our customer support team and we may be able to accommodate.